Introducing a new fish into your tank is a little like sending a kitten into a room full of big dogs. Most of the dogs will play nice, but a few might have the kitten hiding in the corner quivering. In order to maintain the peace, you might have to be the guard dog for a little while, until they all get used to each other and learn to get along. 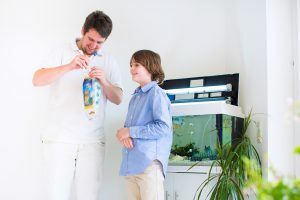 The same basic principles apply when you’re introducing a new fish into your tank, but we have a few additional tips that can help your wildlife get along with each other sooner rather than later, as well as make your new fish feel as comfortable as possible. In addition to maintaining the peace, it’s important to use proper methods when adding a new fish into the aquarium family for the benefit of the fish itself. Placing the fish into your tank before it’s ready could endanger it or your existing wildlife. Following are a few steps and tips that might help. The first step is to talk with an expert, like our Seatech Aquariums technicians, in order to determine if the new fish will be compatible with the wildlife already in your tank. It’s tough to predict with 100% certainty that your fish will be friends, but experience has helped us identify which fish tend to be most and least compatible with each other. 1. 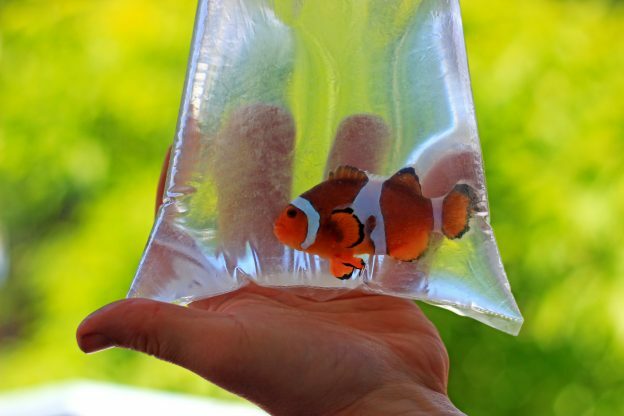 The first step in introducing a new fish into your tank is to float the bag that the fish is in in the tank. This helps the fish get acclimated to the water temperature. The bag needs to be floated for at least 15 minutes. 2. The second step is similar to tempering food items during cooking. Add a cup of water from your tank into the bag where your fish is, and allow the fish to get used to that water. Add another cup about 10 minutes later. This process will allow the fish to at least become familiar with the water quality in its new home before it is forced to socialize with its new roommates. A few minutes later, use a net to remove the fish from the bag and place the fish into the tank. 3. Your new fish is probably used to the water that it was in earlier that day before you brought it home, so try to match the same quality of water in your tank before releasing the newcomer into it. Your chlorine level should be zero for the optimal environment. 4. If you’re not already doing so, after your fish becomes acclimated to its new environment, we would recommend using RODI water for your freshwater and saltwater tanks. If you have a saltwater tank, ask us how to add salt to the water in order to create the perfect solution for your wildlife, or alternatively you can order RODI saltwater from us at Seatech H2O. Feed the fish in your tank before placing the new fish into it. You don’t want your existing fish to confuse their new brother and sister for a nice treat. It’s OK if your fish hides behind the rocks or plants at first. It might be shy or afraid, but it should blend in with the crowd nicely in due time. When you work with us at Seatech Aquariums, we can handle most of the above for you. All you will have to do is enjoy the results and feel the pride when you see that the new guy is completely happy in your fish tank. Call us or see our blog page for more information about fish compatibility, aquarium maintenance tips, and fish facts. This entry was posted in Freshwater Aquariums, Industry News and Tips, Water Quality for Fish and tagged fish tank, New Fish on September 27, 2018 by admin.